Years ago I was experiencing a lot of joint pain mostly in my hands, feet and shoulder blades. After some testing I was diagnosed with rheumatoid arthritis. I was devastated. To make sure I was doing everything I could to take care of myself I made an appointment at Mayo, but there was a three month wait before I could get in to see a rheumatologist. I read everything on the interwebs about joint pain and arthritis and concluded that cutting out nightshades (white potatoes, tomatoes, peppers, eggplant, tomatillos...) was going to be my next experiment. I had already been paleo for sometime so diet restriction was nothing new for me, but being that I cooked a lot of Mexican and German foods at the time- it was a complete bummer. No more green chili or potato pancakes. Then I remembered the yuca fries we had at Brasa. Totally a valid non-nightshade alternative to potatoes. The asian grocery store had it in root form so I chopped, boiled and baked. The sauce was great but the fries were not awesome. Sigh. Then a few months ago I was at El Burrito Mercado and found these in the freezer section! They cooked up perfectly, and in my opinion they taste better than french fries. They have a mild sweetness and you don't have to fry them and fill the house with a greasy fog. 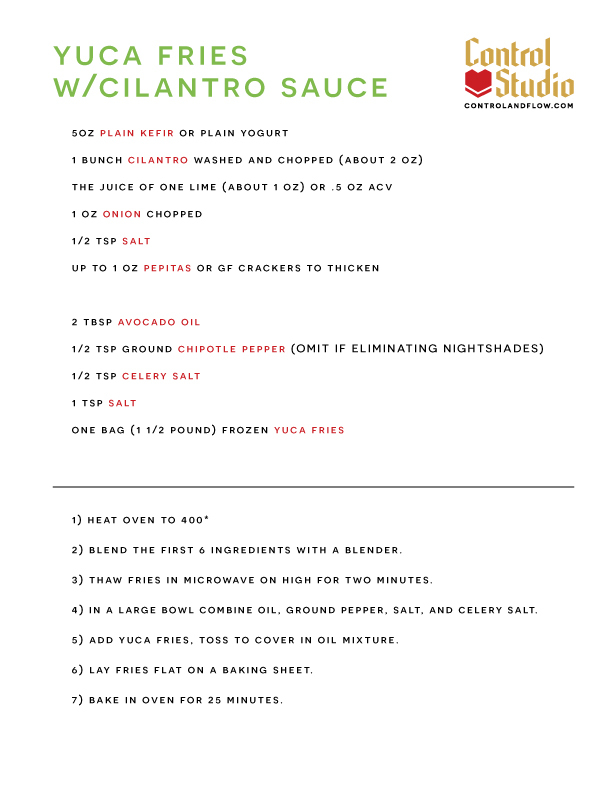 The sauce gets most of it's flavor from cilantro and onion. If you don't have a lime use an ounce of lemon juice or a half TBSP of apple cider vinegar. Sometimes with gluten free cooking sauces can be little runny. Pepitas (raw pumpkin seeds) make a great cuisine appropriate thickener for sure. For unheated sauces, a few nuts or GF crackers are a great alternative to flour. For some people nuts and gluten free grains can also contribute to inflammation, so use them sparingly. Also- skip the chipotle pepper if you are avoiding nightshades. It is mostly added for color anyway. I found out later that yuca (or yucca) products have been used for many years for their anti-inflammatory and anti-arthritic effects. A medicinal plant native to Mexico- "the plant contains several physiologically active phytochemicals. It is a rich source of steroidal saponins, and is used commercially as a saponin source. Saponins have diverse biological effects, including anti-protozoal activity. It has been postulated that saponins may have anti-arthritic properties by suppressing intestinal protozoa which may have a role in joint inflammation." Simple diet changes are a safe way to start biohacking. Give your body the correct inputs and you will start to see changes. I can't say 100% that removing nightshades is what helped my joint pain, but when I finally had my Mayo appointment I did have a significant decrease in pain. They ran a huge array of tests and said I was negative for rheumatoid arthritis. They found only a small amount of inflammation in my little toe and gave me a diagnosis of chronic fatigue/fibromyalgia. I felt somewhat relieved that they didn't find something worse, but I was still so confused.The diagnosis made me feel written off by the whole medical system. I know I was not imagining the pain. Was I crazy? This was not the first time conventional medicine made me confused and frustrated- but at least this time I had knowledge from my own health experiments to know that I can take control over my own health. The more I learned about how to eat to control inflammation, exercise at a level that was appropriate for me, and control stressors (mental and physical,) the better I felt. I still love eating at Brasa. Their food is clean and they aren't weird about people wanting to know their food is gluten free.